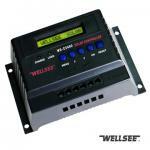 WELLSEE Solar Controller improve your solar life! 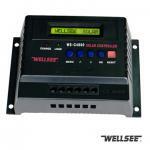 Your Position: > Knowledge >> solar controller >>> WELLSEE Solar Controller improve your solar life! Normally we say a solar controller, or charge controller, solar regulator is used to regulate the voltage and current coming from the solar panels going to the battery. Most "12 volt" panels put out about 16 to 20 volts, so if there is no regulation the batteries will be damaged from overcharging. Most batteries need around 14 to 14.5 volts to get fully charged. Generally, there is no need for a solar controller with the small maintenance, or trickle charge panels, such as the 1 to 5 watt panels. A rough rule is that if the panel puts out about 2 watts or less for each 50 battery amp-hours, then you don't need one. For example, a standard flooded golf car battery is around 210 amp-hours. So to keep up a series pair of them (12 volts) just for maintenance or storage, you would want a panel that is around 4.2 watts. The popular 5 watt panels are close enough, and will not need a controller. If you are maintaining AGM deep cycle batteries, then you can use a smaller 2 to 2 watt panel. If your panels put out 12 volts, the panels will provide power only when cool, under perfect conditions, and full sun. This is not something you can count on in most places. The panels need to provide some extra voltage so that when the sun is low in the sky, or you have heavy haze, cloud cover, or high temperatures, you still get some output from the panel. A fully charged battery is around 12.7 volts at rest (around 13.6 under charge), so the panel has to put out at least that much under worst case conditions. So solar panels work best at cooler temperatures. Roughly, a panel rated at 100 watts at room temperature will be an 83 watt panel at 110 degrees. 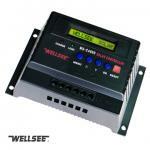 The solar controller regulates this 16 to 20 volts output of the panel down to what the battery needs at the time. This voltage will vary from about 10.5 to 14.6, depending on the state of charge of the battery, the type of battery, in what mode the controller is in, and temperature. But if your voltage is very high, the solar controller will often work with high voltage panels if the maximum input voltage is not exceeded. However, you will lose a lot of power - from 20 to 60% of what your panel is rated at. Charge controls take the output of the panels and feed current to the battery until the battery is fully charged, usually around 13.6 to 14.2 volts. A panel can only put out so many amps, so while the voltage is reduced from say, 33 volts to 13.6 volts, the amps from the panel cannot go higher than the rated amps - so with a 175 watt panel rated at 23 volts/7.6 amps, you will only get 7.6 amps @ 12 volts or so into the battery. The only way to get full power out of high voltage grid tie solar panels is to use an MPPT controller. See the link above for detailed into on MPPT charge controls. Since most MPPT controls can take up to 150 volts DC on the solar panel input side, you can often series two to four of the high voltage panels to reduce wire losses, or to use smaller wire. For example, with the 175 watt panel mentioned above, 2 of them in series would give you 66 volts at 7.6 amps into the MPPT controller, but the controller would convert that down to about 29 amps at 12 volts. Wuhan Wellsee New Energy Industry Co., Ltd.is a big manufacturer of researching and producing solar controller, charge controller, solar regulator, mppt controller and lighting controller, specifications for 12/24/36/48V 6A/10A/15A/20A/25A/30A/40A/50A/60A, and we are researching 80A/100A/120A new type, we are expecting! WELLSEE products domestic sales and exports sales alarmingly rise every year. With years of rich experiences and keen market insight, WELLSEE management decided to expand the scale of production which covered the whole solar system, including five projects : solar panels, solar controllers, solar inverters, solar lights,and solar batteries. Currently, WELLSEE company has appropriated a large land to build PV production base --WELLSEE (China) Photoelectric CO.,LTD , the base located in national high-tech development zone, covering 68 mu(45,333.33 square meters), with the aim to build a modern garden-PV Series Development and production base. Nowadays we are searching five projects: solar panels, solar controllers, solar inverters, solar lights and solar batteries, we believe WELLSEE Solar Controller will improve your solar life greatly, welcome to be our agents!